Monsters love to travel, especially to large cities with a dense population, skyscrapers and monuments where a Monster can pose like Godzilla or King Kong. This week Monster is in New York City, and aside from attending a TV show taping and catching a hot-listed play at the Brooklyn Academy of Music, the thought of food is front and foremost on Monster’s mind! New York City, in addition to being the capital of the world, is also a top foodie destination. The variety rivals the quality in just about everything, and all throughout town, residents and visitors alike will argue over the best bagel, the best hot dog, the best deli, the best pizza, the best chef-of-the-moment… It is the debate over the best cheesecake that brought Monster to Junior’s, a cheesecake bakery and restaurant that has grown from a single Brooklyn location in the 1950s to four store locations today. What can you expect from Junior’s flagship location in Brooklyn? A landmark building that evokes the 50s. Diner vibe with vintage booths and stools at the bar. 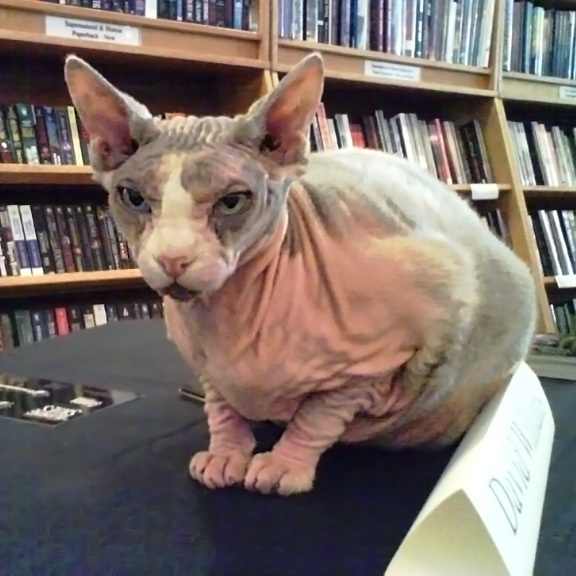 Friendly and casual service with a decidedly Brooklyn attitude. Now it’s a full-fledged restaurant large enough to accommodate wedding receptions with the most extended of extended families, but stay focused: Skip the overpriced entrees (of which there is a huge selection — several pages worth, in fact) and go directly to the cheesecake section — that’s why you’re here anyway. In fact, you may not even want to walk beyond the cheesecake counter, visible from outside and immediately located near the entrance. Sit yourself down and feast your eyes on possibly the largest selection of cheesecakes of traditional and seasonal flavors: plain, strawberry, cherry crumb, apple crumb, chocolate swirl, raspberry swirl, brownie marble swirl, lemon coconut, carrot cake, strawberry shortcake cheesecake… It may just be one of the hardest decisions you’ll ever have to make. May I make a suggestion? Don’t let the many flavors dazzle you to the point of confusion or indecision. Choose a long-time favorite or a classic, and avoid anything so fancy you can’t repeat the name without reading it off the menu, or combines so many ingredients you can’t taste the cheese in the cake. All the flavors are good: rich, decadent, and creamy, with a think crust for contrast. Monster’s favorite, though, is the strawberry cheesecake topped with so many fresh strawberries Monster would challenge you to try to squeeze one more in without the whole layer starting to slide down its base! The combination is just perfect: the tartness and juiciness of the fruit completes the creamy sweetness of the cheese, and the result is the universe in harmony, a balance between yin and yang. Should you really want a full meal, Junior’s restaurant offers everything a you’d expect a diner to offer: breakfast, soup, salad, sandwiches, and more: from buffalo wings to homemade chili, from Hungarian beef goulash to Southern style fried catfish, from BBQ baby back ribs to Caribbean style lobster tails. Something must catch your fancy here. Serving size is generous, though quality is only average. Great for families and groups. Not nearby? No problem. 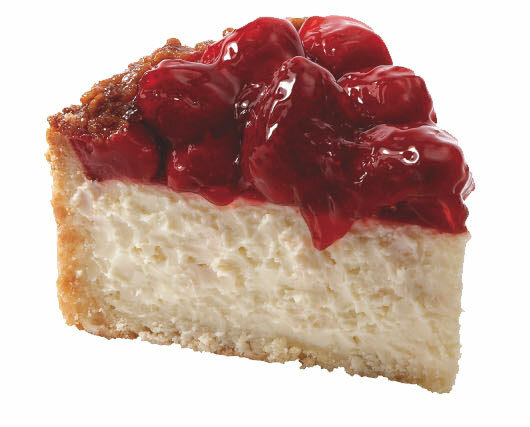 Juniors offers online ordering of their famous cheesecakes and two-day and overnight shipping, so that you can get your cheesecake fix without leaving your home. 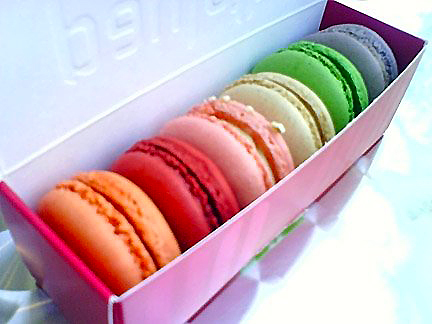 Yummy Macarons at Paulette, Now in San Francisco! There’s something about a macaron that renders it irresistible to almost everyone — especially Monsters! (What, aren’t you familiar with the Cookie Monster? Monsters are obsessed with dessert!) Is it the fluffy-as-cloud almond batter? Or the intense flavor of the melts-in-your-mouth filling? Or perhaps it’s the cute sandwich forms in a rainbow range of colors? It certainly doesn’t hurt that it is rarely spotted in a U.S. bakery that each discovery carries with it a special hint of decadent pleasure! Six different macaron flavors from Paulette Macarons: passion fruit, raspberry, sweet wedding almond, Madagascar vanilla, Sicilian pistachio, and a surprisingly delicious violet cassis. San Francisco foodies have been coveting those lucky enough to reside near Beverly Hills, where Paulette Macarons has been a Mecca for macaron worshipers. Well, great news! Paulette has opened a store in the trendy Hayes Valley neighborhood of San Francisco! Yay! Hand-made daily with care by master pastry chef Christophe Michalak and air-transported from Beverly Hills, these little cookies come in a dozen flavors, from the traditional Vanilla and Pistachio to the less common Rose and Violet. Load up on your favorite flavor or try one of each. What’s your favorite flavor? 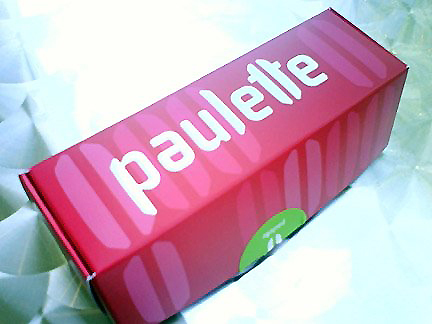 Paulette's signature box for six macarons. The Hayes Valley store offers limited indoor and outdoor seating, perfect if you can’t make it out the door without sampling a delicious macaron…or a dozen. Or, order online in case they run out of your favorite flavor! Just when you think these little desserts couldn’t possibly be dressed up any prettier, Paulette comes through with cute gift boxes perfectly sized for two, six, twelve, or twenty-four macarons. Guaranteed to delight any friend, hostess, or birthday girl/guy/monster! 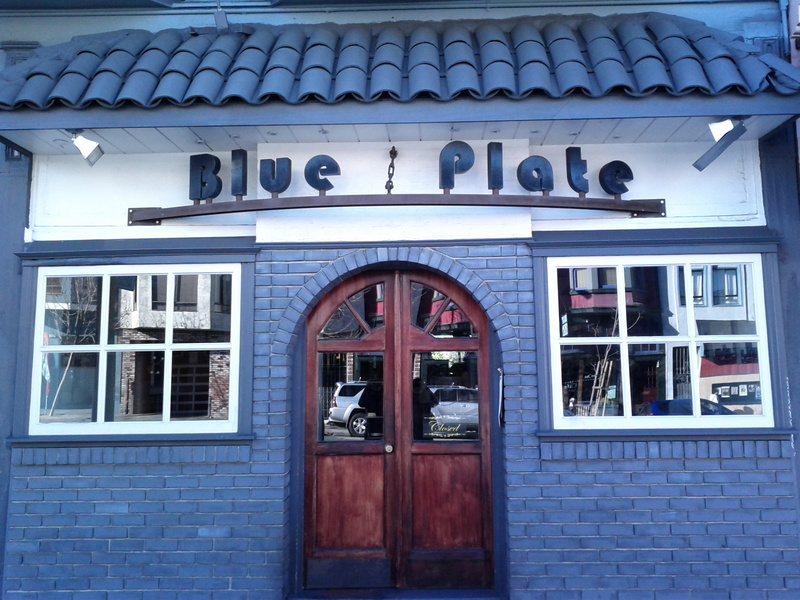 Blue Plate, a place for high caliber, organic, free-range comfort food, popular among the San Francisco hipster foodies who whisper its name in reverence. An understated front with an old-fashioned neon EAT sign underlines its coolness: business is good enough that no advertising is necessary. A place to see and be seen, its tight seating arrangement especially in the front section is not conducive for Monster gatherings (or even human parties with kids); luckily, the back dining section over-looking a backyard offers a few tables for large groups. Reservation is essential, as there is no waiting area, and one can only look cool and hip and nonchalant for so long while shivering in the cold outside its entrance, shooting longing glances at the clipboard wait list on the wall. Food quality is definitely very good, though perhaps menu options are not what one may consider fine dining: think meatloaf instead of foie gras. Macaroni and drunken Spanish goat cheese (side dish): a must. Perfectly cooked macaroni with cheese so finger-licking-delicious you’ll be wiping the dish clean. Brussels sprouts (side dish): None of the main dishes comes with a healthy serving of vegetables. If you’re a fan of brussel sprouts (everyone seems to either love them or hate them), get the side dish here. It comes with just the right amount of garlic and a pinch of chili to make it interesting. The bread crumbs bring a hint of crunchiness and makes it pair very well with the Mac & Cheese (see above). Meatloaf: Their signature dish, Monster-sized, or, large enough for two humans. Not your mom’s meatloaf — in a good way. It comes with mashed potatoes that hold their own. The green beans are so few one might wonder if the kitchen were running low. Ribeye steak: Again, Monster-sized portions. Excellent meat, though the kitchen tends to overcook slightly: the rare looks more like medium-rare to me, the medium a tad well-done — not the best way to treat a top cut of meat. Fried chicken: Nothing to complain about, but if that’s your thing, head over to The Front Porch a mere block away, which does it better. Or, there’s always Farmer Brown’s Little Skillet in Soma, where the food is so good the restaurant operates without tables or even cloth napkins. Save room for dessert: chocolate cake with melted caramel, creme brulee, etc. Excellent wine list. Service is a bit hit & miss. 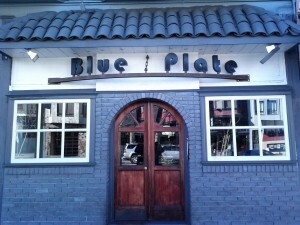 The place is positively hopping and requests for more water or another glass of wine may take a while to get fulfilled. Can get loud.